Of the five scripts nominated for Best Screenplay Based on Material Previously Produced or Published, four are for films also nominated for Best Picture, three have Lead Actor nominations (the other three acting categories each has one performance from an Adapted Screenplay nominee), and only one has a nod for its director. Three of the films in this category are based on true stories (two from memoirs, only one about a person who is still alive). Two of those are period pieces about British scientists, while two center around wars. Only two of the five are by writer-directors, and only one is by a writer who has been nominated previously. All of the nominated writers are white males, and all five films follow a single protagonist, also a white male; only Whiplash has a definitive, personified antagonist. The wild card in all its races, Sniper's strong showing seemed to surprise Oscar watchers and box office analysts alike. It's one of only five films nominated in any category to have earned more than $250 million, with the other four (Guardians of the Galaxy, Captain America, The Hobbit, and The LEGO Movie) relegated to tech categories (makeup, visual effects, and sound editing) and best song. 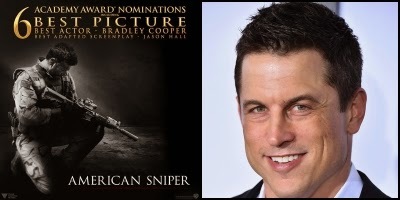 Like The Hurt Locker six years ago, Sniper profiles an American military hero's combat in the Iraq War. Like the Iran-set Argo just two years ago, the first reaction to Sniper's six nominations was over the snub to its movie-star director. Locker and Argo both went on to become the big winners of their respective Oscar nights, taking home trophies not only for their screenplays, but also for Best Picture. Sniper has drummed up the most controversy of the five nominees, getting more people talking about it, which may also boost its chances for an upset on the big night. The film's other nods are for its lead actor Bradley Cooper, editing, sound mixing, sound editing, and Best Picture, while the script was also nominated for BAFTA and WGA awards. This is the third feature screenwriting credit for Jason Hall, who had a recurring role on Buffy the Vampire Slayer, not unlike co-star Danny Strong, who went on to win an Emmy and two WGA awards for writing HBO's political docudramas Game Change and Recount. The screenplay, which topped the 2011 Black List, tells the little-known secret history of how a nerdy British scientist helped defeat Nazi Germany in World War II and pioneered the development of the modern digital computer but suffered severe and harsh punishment for being gay. 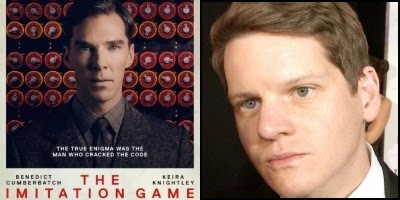 The Imitation Game is Graham Moore's feature screenwriting debut. His previous screenwriting credits include two shorts and an episode of the ABC Family sitcom 10 Things I Hate About You. Also a novelist, his 2010 literary debut, The Sherlockian, was a New York Times bestseller. He recently adapted The Devil in the White City for Warner Bros., with Leonardo DiCaprio attached to play America's first known serial killer, and is working on his second novel. Going into the Oscars, the film has 8 nominations, more than any of its competitors in the adapted screenplay category and the third highest take overall. It's the only one of these five scripts also nominated for a Golden Globe, where originals and adaptations are not separated and Gone Girl was the only other adaptation cited. The film is the second-highest earner in its category and the only one of the five with a directing nod, and the script was also nominated for BAFTA and WGA awards and took home the USC Scripter award. With no public backlash over controversial liberties that all historical dramas take with the truth (Turing and his team were never the ones to decide to let certain Allied ships get bombed, and none of them had a brother on those ships) -- meaning the script and its execution are so good that audiences are believing it all -- Moore seems to be the most likely adapter to take home a prize from the Oscars. Learn more about Moore in his Crave Online interview. Based on the 2009 novel by Thomas Pynchon. The only nominated script this year adapted from a novel, the lone comedy in the category, and the only nominated adaptation not also nominated for Best Picture. 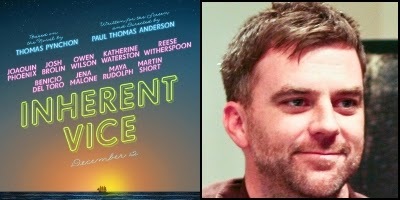 Paul Thomas Anderson's last four films (skipping Punch-Drunk Love) have earned 17 Oscar nominations, with only two wins. Seven of those nods were for acting, including Burt Reynolds (his only at-bat so far), Juliane Moore (her first), Tom Cruise, Phillip Seymour Hoffman, Amy Adams, Vice star Joaquin Phoenix, and a win for Daniel Day-Lewis in There Will Be Blood, PTA's highest grosser. Vice is his second screenplay adaptation, and his third screenwriting nomination. He was previously lauded in the Adapted category for Blood (very loosely adapted from the 1927 Upton Sinclair novel Oil!) and competed in the Original race with Magnolia and Boogie Nights (which he first made as a short entitled The Dirk Diggler Story in 1988). With only one other nomination, for Vice's costumes, and his weakest box office performance since his pre-Boogie Nights feature debut, Hard Eight, following last year's polarizing The Master, has Anderson's star started to fade? Look for PTA to be the least likely to take home the prize in this category this year. The second entry focused on a famous mid-20th century British scientist, The Theory of Everything is the only one of the four true stories represented in this category whose subjects, Stephen and Jane Hawking, are still alive. The script follows the world-renowned physicist in standard biopic format, highlighting a gifted person's struggles with a crippling disease or disability in the tradition of such distinguished Oscar alumni as My Left Foot, Hilary and Jackie, Lorenzo's Oil, Ray, Shine, A Beautiful Mind, and The King's Speech, only the last two of which took home Oscars for their screenplays. Kiwi playwright and novelist Anthony McCarten made his on-screen debut as a zombie in fellow Kiwi filmmaker Peter Jackson's Brain Dead. His previous screenwriting credits are all adaptations of his own novels or plays, and he directed two of those films. 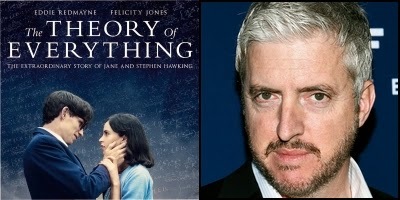 McCarten began writing his Hawking screenplay in 2004, on spec, working on it for eight years with Jane Hawking's cautious approval before finally convincing her to sell him the rights. He is also a producer on the film. With SAG and BAFTA wins, the film's star, Eddie Redmayne, has the slight edge in a competitive Best Actor race. Theory is also nominated for Best Picture, Best Actress, and Best Score. The screenplay was ineligible for a WGA award, but that didn't stop 12 Years a Slave from winning in this category last year. On the other hand, McCarten nabbed a BAFTA in this category, which only has a 40% track record of matching Oscar over the last ten years. Based on his 2013 short film Whiplash. A young jazz drummer striving for greatness is pushed to his limits, Rocky-style, by a mentor who makes the drill sergeant in Full Metal Jacket seem like Gandhi. Whiplash is the head-scratcher of this category. 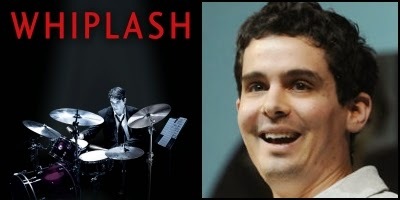 Damien Chazelle's original, feature-length spec script landed on the 2012 Black List. Unable to secure financing, he convinced J.K. Simmons to spend three days filming one scene from the script as a demo. That rehearsal footage was then released as a short at Sundance in 2013, where it won a jury prize, helping the feature film get made. The full-length 2014 version does not carry a "based on" credit and the WGA nominated it in its Original Screenplay category (as did BAFTA). The Academy, however, chose to treat it as an adaptation of the short. Tied with The Theory of Everything, Foxcatcher, and Interstellar at five nominations, including Best Picture, the film is expected to walk away with a Supporting Actor win for Simmons, who has been collecting prizes all season, including the Golden Globe (the film's only Globe nod), BAFTA, and SAG awards. Also nominated for four Independent Spirit Awards, but not for its screenplay, Whiplash, which has not had a wide release, is the lowest grosser in the Best Picture race and second-to-last of the adapted screenplay nominees, just ahead of Inherent Vice, the only other writer-director project in this category. Oscar loves stories of artists struggling to achieve perfection (see Birdman), but voters may feel they are already rewarding the script's sparkling dialogue by putting a statuette in the hands of the actor whose mouth it came out of. The confusion over whether this really should be competing with three true stories and an acclaimed novel's adaptation may also hurt its chances here. This would be a dark horse if it wins.